One of the advantages of using a pre-paid carrier is buying a new phone without getting locked into a two-year contract. MetroPCS, the nation's fifth largest carrier and the largest pre-paid operator in the country, introduced a new handset on Thursday, the ZTE Avid 4G. If the name sounds familiar, it's because we showed you a leaked photograph of the phone last month. The handset is powered by Android 4.0 and includes a unified messaging app called joyn that allows you to send free IMs, make calls over the internet and enables video chat. It also allows you to see in real time if a message that you sent has been read, and if a reply is being typed. The ZTE Avid 4G is equipped with a 4 inch WVGA screen with a 233ppi pixel density. Under the hood is a dual-core 1.2GHz processor. 2.3GB of internal storage can be pumped up using the 32GB capacity microSD slot on the phone. On the back is where you will find the 5MP camera with flash, and a VGA front facing shooter handles self-portraits and video chat. The 1730mAh battery keeps the lights on for four hours of talk time, and the device offers 4G connectivity over the carrier's LTE network. 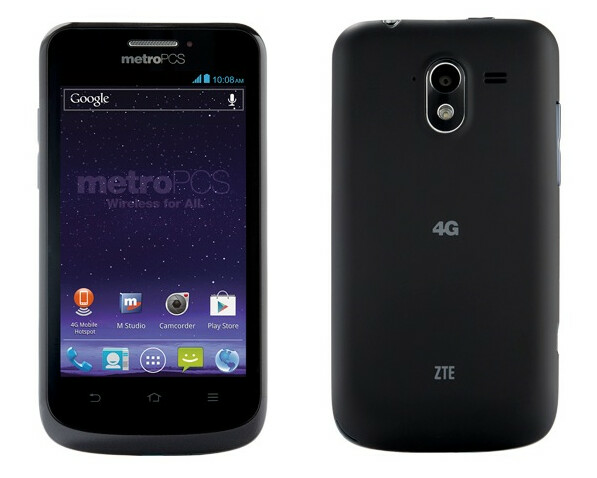 The ZTE Avid 4G is available now from MetroPCS for $149 and to get that price, you do not need to tie yourself up by signing a two-year contract. That feels a lot less constricting, hmm? Good move. A medium range decent 4G capable phone. 4.1 would have made it better. You know they have the GSIII, right?